I admit, I am a die hard fan of the Kapamilya network since I became knowledgeable about television. I am aware of the network rivalry between Kapamilya and Kapuso, I even made a critic about it when I was still in college. Both TV networks aim to get the highest ratings and both wanted to be number one. I always believed that ABS-CBN is number one. It was only when the AlDub sensation became a craze that I believed GMA got the number one rating on its noontime show, Eat Bulaga. I am not, in any way, doing a television critic, but this AlDub tandem really captured the hearts of the audience, unexpectedly. What makes them a unique love team? I bet you have seen a lot of teen sensations all over television. 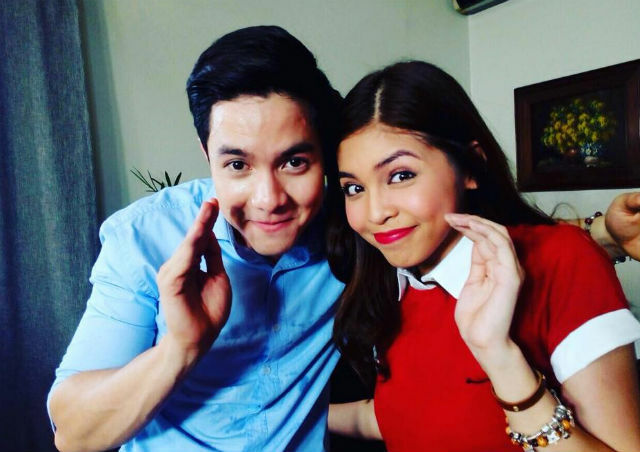 Today's biggest on-screen love teams are already being compared to AlDub. Name it, KathNiel, JaDine, LizQuen. I have read a lot of comparisons between these tandems, and I am here to make a point why AlDub is unique. Also, I will clear that KathNiel and LizQuen has this unbeatable chemistry, and I still love these pairs. They are paired naturally. It all started when Eat Bulaga's segment Juan for All, All for Juan Problem Solving. The camera accidentally captured the real spark between Alden and Maine. AlDub's tandem is very natural. You would know that the very first time you saw them on television, everything wasn't scripted. They don't speak, but it feels like they are saying everything their heart wish to say. If you will actually compare their tandem to other love teams, others are only seen on television with scripts. You would know that with every look and every smile from that split screen, AlDub expresses their feelings. Through their heartfelt dubsmash messages, and handwritten messages to each other, though without hugot lines, you can easily follow their story. Everything is unpredictable and exciting. People are going crazy over them. Everyone is excited to know when will the two finally meet. Can you imagine a love team who haven't met yet, who haven't heard each other's voices yet, but they are giving so much kilig to the audience? We couldn't predict what would happen next, and admit it, we are looking forward to the next episode and we don't want it to end. Their story teaches us lessons about Love. This has been showcased by Lola Nidora (Wally Bayola) through every hugot line. There's something new every episode. Love takes time. You don't need to rush everything. Distance is not a big deal. You can't just force someone to fall in love with you. Acceptance. Even though Maine makes funny and wacky faces on cam, Alden didn't make it a big deal. Others are too scared to show off their funny faces, but Maine is just too brave to be her real self on nationwide TV. If s/he's the one for you, no matter how many challenges and struggles you go through, you will always find yourself back together to share your forever together. and many more! Feel free to add. Fangirl meets Celebrity Crush Story. It's like a fangirl's dream come true to be paired with her ultimate celebrity crush. Everybody knows Maine has a big crush on Alden. Who would have thought that she's lucky enough to be his love team? I have read comments from different social media that AlDub is a threat to the other well-known love teams. You be the judge. Will they overpower the other network's teen love teams? I honestly support their tandem although I am not a die hard fan. What you said were all true. They are unique in that way. They broke all the rules in putting two celebs to make a love team. The people chose them first. I don't even know why people have this need to compare. Why can't they just enjoy it? if they don't like it, then they should stop watching and watch something they like. It feels like they have a long journey together as a love team and everything is unpredictable for me.